Union County, NJ – On Saturday, October 27 Union County residents with unwanted guns in their possession can turn them in for up to $250 each at either of two locations, in Elizabeth and Plainfield. Anyone turning in a gun may do so anonymously. Gun buybacks are designed to enable anyone to turn in any gun, in any condition, with no questions asked. The program provides for residents to turn in up to three firearms and receive up to $250 for each weapon. Elizabeth: The Macedonia Baptist Church, at 1251 Fairmount Avenue. Plainfield: The Visions of God Family Worship Church, 350 Leland Avenue. Participants are advised that weapons transported by car must be put in a closed container and kept in the trunk. To reduce any risk of theft or mishap, participants are also advised to proceed directly to the drop-off location, without making any stops for errands or social calls. 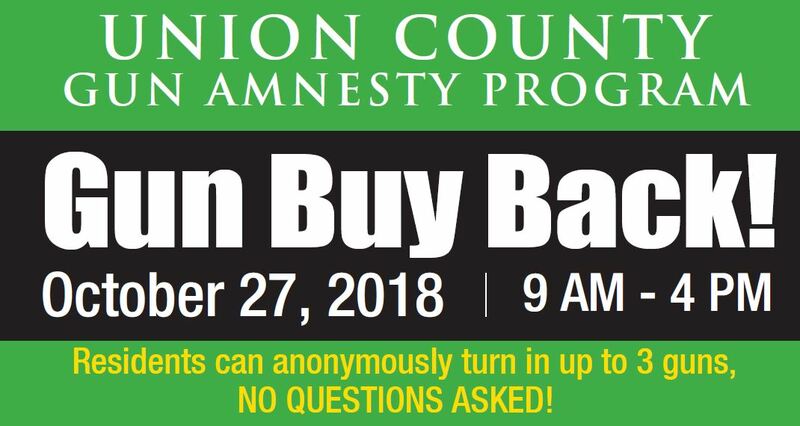 The gun buyback event is supported by the Union County Board of Chosen Freeholders and sponsored by the Union County Prosecutor and the Union County Sheriff with the Union County Division of Police and the police departments of the cities of Elizabeth and Plainfield.